Activity time each day in the Denair Elementary State Preschool is a choreographed frenzy of exploration, excitement and energy among two dozen 3- and 4-year-olds and a team of skilled educators. To the untrained eye, it may seem slightly chaotic, but rest assured – learning is happening at a rapid rate. In one corner of the classroom, the focus is on science. There is a small fish tank and another for a lizard. There are rocks and shells and blocks to hold and count. There is a magnifying glass, a small weight scale and an array of colorful objects. 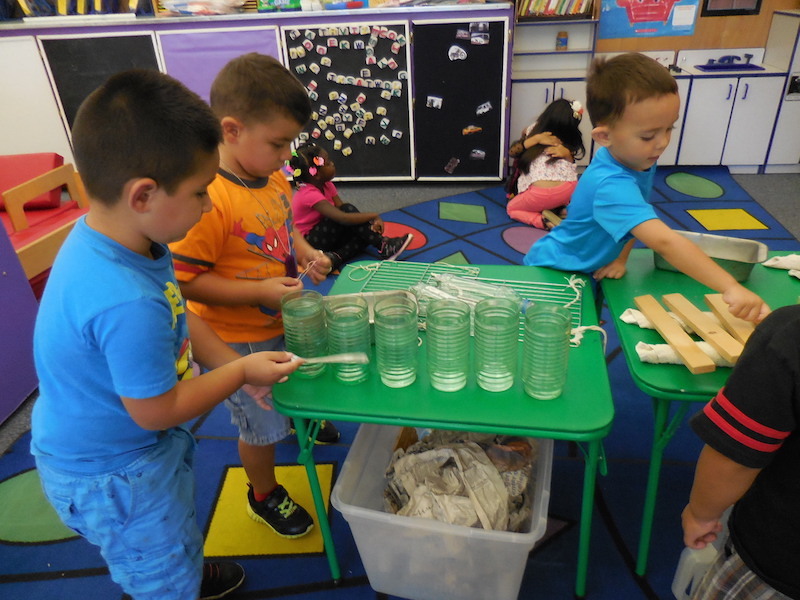 Youngsters use a small water tank to test what floats and what sinks. Across the room, there is more introductory science and math. Giggling children in mini-lab coats and goggles find out what happens when vinegar is mixed with baking soda, use oversized tweezers to count how many seeds are in a pumpkin or eagerly work a magnet to see whether metal or plastic items are affected by it. Nearby, students wearing smocks paint their names or discover what colors are created when others are mixed. Their previous artwork hangs proudly on the wall. There are multiple computers with programs in English and Spanish. There is an area set aside for reading, and blocks and toys and pencils and paper available around the room. It is a vibrant place, with plenty of visual, verbal and sensory stimulation. No doubt, it’s a fun way for a preschooler to spend three hours a day. Site supervisor Mary Worman and Lenora Gomes share teaching duties for the two classes – one from 8:15 to 11:15 a.m. and the other from 11:45 a.m. to 2:45 p.m. Para-professionals Shirley Corriea, Erica Prock, Cassie Talaga and Sandra Wynne patiently help with lessons and individual instruction. The staff spends plenty of their time on their knees or sitting on the floor to get to eye level with their students. A little boy’s excited shriek of, “It turns green,” when the vinegar with dye in it touches the white baking soda is a chance for Gomes to ask him what he expected to happen and have him expand his vocabulary. Using an eye-dropper to apply the vinegar develops fine motor skills and reinforces his counting ability. The same reasoning applies to the table with magnets or the floating exercise at the water tank. “We ask a lot of open-ended questions trying to get them to think why things are doing what they do,” said Gomes, a Denair native who once attended kindergarten in the same classroom in which she now teaches. Worman said the emphasis on science has been in place since the preschool opened in 2002. There is even a garden outside where students and their teachers plant seeds, then watch what happens together. “I think we go the extra mile as far as science,” she said. There also is special attention given to children for whom English is a second language. Some of the computers feature word games in Spanish that provide the English translations. Each session begins with students washing their hands and then writing their names. Teachers invite them to look around and discover which classmates might be absent. Then it’s outside for 45 minutes of play time, followed by a snack provided from the elementary school cafeteria. Next comes a story and short discussion about its key message, which transitions to 40 minutes of activity time. Class ends with the children sitting in a semi-circle as Gomes or Worman review the day’s lessons. Parents or guardians must sign their youngsters in and out of class. The limit is 24 students per class; both are full. There is a short waiting list, with preference given to 4-year-olds. Students come from Denair, Turlock, Modesto, Waterford and throughout the region. Worman said the lessons – scientific and otherwise – learned in preschool pay dividends as children continue their educations. 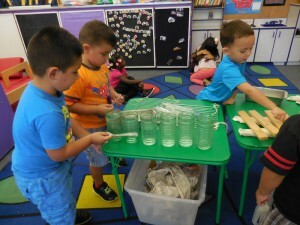 For more on the Denair Elementary State Preschool, go to www.dusd.k12.ca.us/desp/ or call (209) 634-9468. Posted in News and tagged Denair Elementary State Preschool. Ray Prock liked this on Facebook. Julie Castro-Norman liked this on Facebook.